Mike McIntosh was a pastor, mentor and phenomenal servant leader in Federal Way. 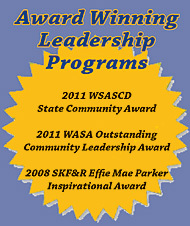 He was one of Advancing Leadership’s founders and supported the program as a volunteer and speaker. Mike was a vocal advocate for breaking down barriers and building up support to allow every person to reach their full potential, regardless of circumstances. When Mike passed away in 2007, a scholarship fund was established in his name. The Mike McIntosh Memorial Scholarship provides tuition assistance for men and women who wish to participate in the Advancing Leadership adult program, but cannot afford the full tuition. Because large companies typically cover the cost of the program for their employees as professional development, preference for this scholarship is given to applicants who work for small businesses, nonprofits, are self-employed or unemployed. Applications for this scholarship are accepted annually during the ALA application process. Scholarship availability depends on current level of funding. Contributions to the scholarship fund are tax-deductible and accepted year-round.